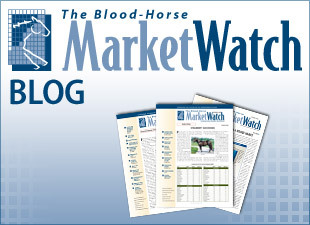 The September issue of MarketWatch included profiles of eight sires that we considered to be undervalued based on their yearling averages, earnings per starter, and/or progeny statistics compared with their 2013 fees. 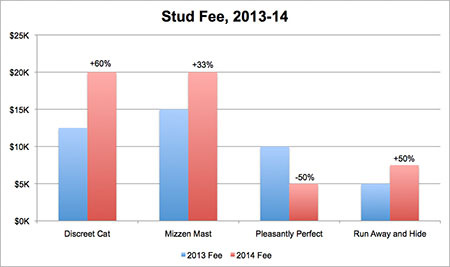 Now that most 2014 fee announcements have been made, let's review the stallions and their current outlook. Discreet Cat had the largest fee increase of the eight stallions on our list, jumping from $12,500 to $20,000 (+60%) for 2014. With six graded stakes winners in 2013 including grade I winners Secret Compass and Discreet Marq, Discreet Cat ranks third on the third-crop sires list, and he is second to Street Sense by earnings per starter for his crop. 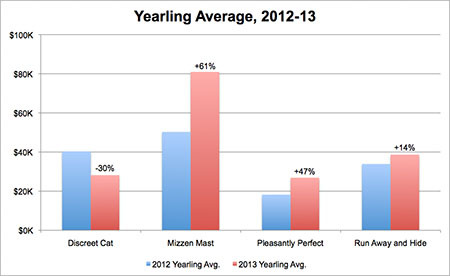 As is common for fourth-crop yearling sires, his yearling average decreased in 2013, averaging 1.4 times his 2014 fee. Expect that ratio to improve with future crops as Discreet Cat is likely to attract better mares going forward. Mizzen Mast, one of the more prominent undervalued sires on our list, also earned a fee increase this year. After the success of his two-time Breeders' Cup Turf Sprint (gr. IT) winner Mizdirection as well as French One Thousand Guineas (Fr-I) winner Flotilla, it was no surprise to see his fee rise from $15,000 to $20,000. Prior to Mizdirection's repeat Breeders' Cup win, Mizzen Mast also saw improvement in the sales ring. His yearling average increased by +61% from 2012, led by a $380,000 full sister to graded stakes winner Strike the Bell. 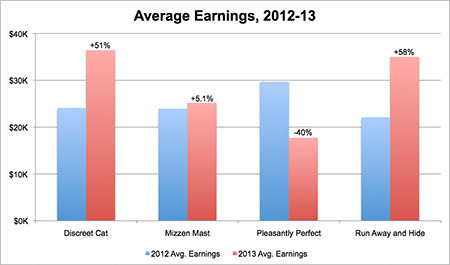 Pleasantly Perfect is one of two stallions on our list of undervalued sires list to see a decrease in stud fee for 2014. After a lackluster year on the track for his progeny (no stakes winners in 2013 to date), his fee was cut in half, from $10,000 to $5,000. However, Pleasantly Perfect did show strength in the sales ring this year, having more than twice as many yearlings sell than in 2012. His yearling average was up +47% to $26,859, which is 5.4 times his reduced 2014 fee. Second-crop sire Run Away and Hide has clearly outperformed in relation to the quality of mares that he has covered so far in his career. Despite having a CI of less than 1.50 in each of his first five years at stud, the son of City Zip is 10th on the second-crop sires list and he leads those sires (including grade I sires Curlin, Majestic Warrior, Midnight Lute, and Into Mischief) by graded stakes winners from starters (6.1%). Run Away and Hide's fee was increased from $5,000 to $7,500 for the 2014 season, a move that should coincide with a well-deserved improvement in mare quality.